I just happened to take a look at the all-time views data for my review of the card game Ninety-Nine. As of this writing, it has been viewed 99 times. A chance to play my copy of Die Mächer (which I bought over a year ago) with four other eager newbies in a location devoid of disturbances and distractions. The Cliche is that it’s an honour just to be nominated, and it really it. Nevertheless winning something is really nice too. 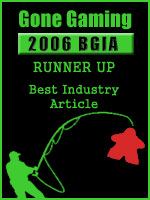 Gone Gaming named An Introduction to Elegance the second runner-up in the category Best Industry Article, behind the always great Chris Farrell‘s Here I Stand and Big Decks and the underappreciated (and sadly inactive) Mario Lanza‘s Fill in the Blank, about the geeky, but perrenial, topic of box inserts. I am very proud, and honoured. Considering my failure so far to follow up as promised, I have to say that Introduction to Elegance must have been better than I thought to be considered worthy of consideration, let alone in actual contention. It was, to my thinking, the ugly step sister of the series, necessary to clear up a few points before moving on. Thank you to the Gone Gaming crew for honouring me so. I encourage my readers to check out all of the winners and runners-up. This post is to reassure those of you who are interested in my (alleged) series on elegance that, no, I have not abandoned it, and yes, I am actually working on part 2. Unfortunately, part 2 is being a bit difficult. My first draft was unusually rough, even by my humble standards. Over the last couple of weeks I have been editing it, but it has been a bit of an uphill struggle. Right now I am wavering on the edge. On the one hand, it has already been well over two months since I posted part one, and people may justifiably be losing patience. I could just put up what I have now, which is complete but rather stilted reading, on Monday or Tuesday. On the other, the perfectionist in me doesn’t want to subject you to rather mediocre writing, especially in a post of this length. Getting a polished essay would mean a couple more weeks of editing, though, and possibly more if I decide to chuck what I have and start again from scratch. So I ask you, my readers (all three of you :), which would you rather? See it now, but suffer through a rather rough essay, or continue waiting as long as it takes to get a good read, making due with other topics — I have stuff in the hopper that I think is interesting, but isn’t a major production number like this — in the meantime? P.S. If you’re looking for some good writing about elegance to tide you over, may I suggest Jonathan Degann‘s The Well Constructed Game? I’ve been holding off reading it myself until after I finish up part 2 so that it doesn’t just ape Jonathan, but his stuff always comes highly recommended by me. My Play now has a new feature. Through the magic of WordPress widgets and the BlinkList social bookmarking service, There are now a pair of linkrolls in My Play’s sidebar, one for boardgaming links and one for RPG links. So my (wireless) keyboard crapped out a couple days ago. I haven’t quite given it up for dead yet, but it doesn’t look good. My backup keyboard has a spacebar that you could break your thumb on without producing whitespace. I all but have to lean on it, which makes typing more than a couple of paragraphs a chore. So My Play will be on temporary hiatus until I get a usable keyboard. At most, if this lasts too long, I may indulge in a little linkblogging to let you all know that I am still alive.